THE INK WAS BARELY DRY ON THE MASKED WAGTAIL and up popped another golden opportunity, Dusky Thrush. I wrote yesterday 'when will it end?' and OK it's winter now but it feels like the autumn didn't stop producing great eastern vagrants yet. I can't recall a period as exciting as this since I started twitching, when we used to see a lifer almost every weekend. It is now almost 60 years since the Hartlepool Headland Dusky Thrush, now recognised as one of the first ever twitches in the UK, news of which was passed on by post! I was asleep when news of the 2013 Margate bird broke (although happily I missed out on a ride with sherbie the day after it had gone) so I was very keen to see this one. I guess it was on the cards after a few near misses recently, so not such a big surprise but it was really nice how today's big event came together and also to share it with so many friends. After downing tools at work Pete and I made a dash to Beeley in deepest Derbyshire (never been here before either). We arrived to find that it is located in a kind of cold sink valley bottom and was still very misty. 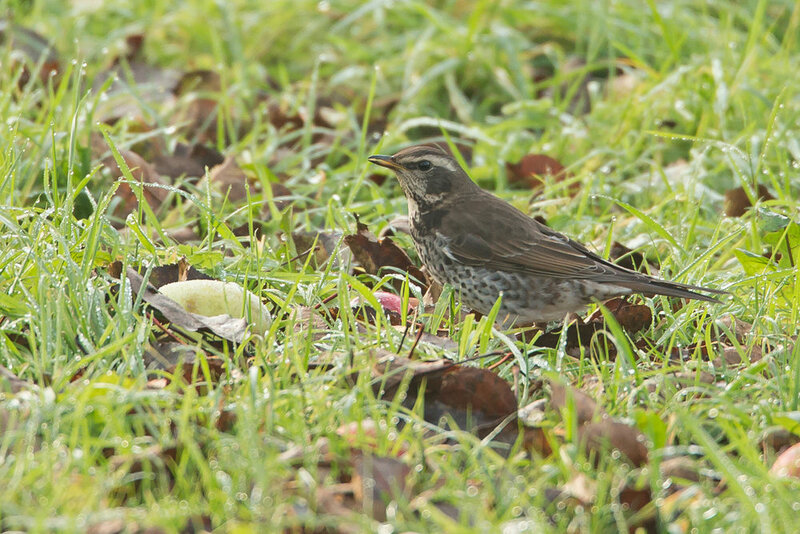 After an appalling view, just about tickable (after looking at my photos) we hung around, eventually joined the coming together of the scattered crowds and enjoyed some lovely views of the thrush eating fallen apples in the orchard next to the activity centre. Wonderful! Very sorry about adding to the shutter noise though! I wonder if there might be something else lurking in the countryside waiting to be found. Surely there must be some Siberian Accentors somewhere? However, we don't need to go out to look for them, non-birders with cameras will find them for us! A big thank you to Beeley birder Rachel Jones for finding the Dusky Thrush, I bet she never made this many weird old men happy before. Also to the outdoor activity centre in Beeley who allowed the invasion of the twitchers and the Birdquest office team who are used to being abandoned at short notice, thanks everyone! The Dusky Thrush's favourite apple orchard in Beeley.